Sometimes printing in upper and lower case letters is required. The techniques for printing in this way accurately is shown below. Draw three guidelines to the exact measurements shown below. This time print your name in Upper and Lower case letters. Look carefully at the measurements, the lower case guideline more than half the measurement of the Upper Case Guideline. Print the letters very carefully and keep to a plain and simple style. Fancy or elaborate styles are not required at this stage. The difference between the two basic styles (Block Capitals and a mixture of uppercase and lower case letters can be seen below. 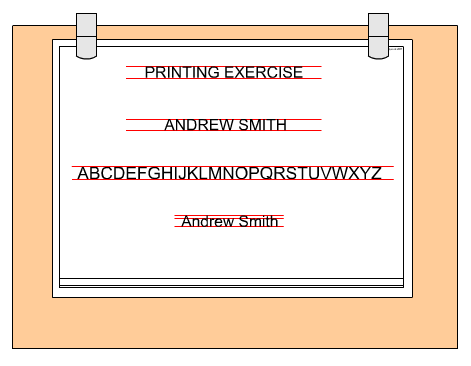 Print your own name in both BLOCK CAPITALS and also as a mixture of upper and lower case letters.